In a small sauce pan, combine one tablespoon of sugar and half of a juiced meyer lemon. Warm the mixture over a medium-low heat until the sugar is dissolved. Add one cup of the jalapeño-raspberry jam and mix well. Remove form heat and let cool. If you dont' have any jalapeño-raspberry jam on hand, do not fret! You can use plain ol' raspberry jam instead. But if you want it spicy (and trust me, you do), we are gonna have to make some simple tweaks. Slice and seed a jalapeño pepper and add 1/2 of it to the raspberry jam mixture. Bring the whole thing to a slight boil, remove the rings, and let it cool. Viola! Combine the softened cream cheese, 3/4 cup of sugar, three eggs, a tablespoon of vanilla and the two tablespoons of lemon zest into a large bowl and mix well. It is very, very important that the cream cheese has fully softened. If it hasn't, it will be a nightmare to work with and your mixture will end up lumpy. Using a prepared miniature cupcake pan, fill each mini baking cup with the chopped pistachios. Use just enough to cover the bottom of the cup with a thin layer. Next, fill each baking cup with the cheesecake mixture. 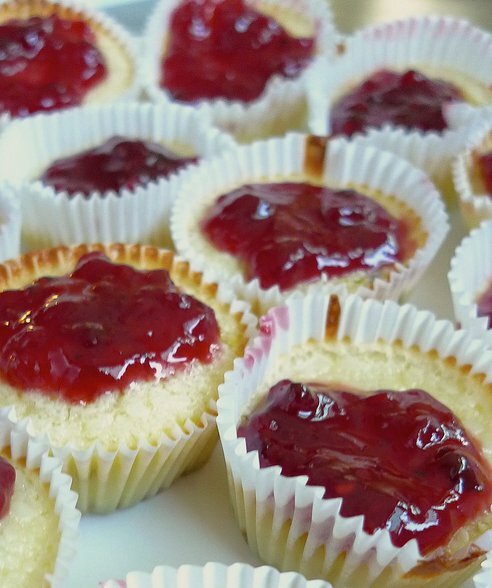 Cook the mini cheesecakes at 350 degrees for about 20 minutes, then remove them from the oven and let them cool. I suggest you put them in the fridge for an hour once they are just barely warm to the touch. Top with the raspberry sauce and serve. Enjoy!